More than once in a week, we stumble upon a website with a slow loading time. It’s frustrating, takes away our precious minutes, and most importantly, we’re usually closing the tab sooner than the site’s finished loading. Naturally, your job as a company owner is to at least give the visitors a decent site speed while improving SEO. Let’s see which steps you can take to optimize videos for a better user experience and to boost your SEO game. Motion Graphic Video or 3D Product Animation Video: Is It Even Worth Watching? The first thing that comes to mind when talking about videos is the type you’re going to use. It has to engage the viewer in a way that they’re going to watch it until the end. For example, there’s screencast explainer video, meaning it explains how a certain product works and it’s usually no more than 5 minutes long. It comes in handy when marketing a product that has a few steps in the application process. Another type you can stumble upon is a motion graphic video. These videos use various graphics to deliver the ideas. They mostly explain complex topics and they can be found in the digital marketing industry. The third one, and the most popular one in the last year is 3D product animation video. Since regular explainer videos can be hard to follow, a 3D animation video can show all those little details that get hidden otherwise. It’s perfect for the use in construction and consumer products industries. The selection of the hosting platform you’re going to use depends on what you want to achieve with the video. When your primary goal is to simply “spread the word” about your company, it’s convenient to use the platforms like Vimeo or YouTube. Your viewers will most likely end up on these sites since they redirect the video after indexing. You may not bring more traffic to your site, but your video may become popular. On the other hand, if you’re more interested in getting on-site traffic, uploading the video will rely upon your CMS (content management system) platform. The hosts such as vzaar or Vidyard can really come in handy. Vidyard leaves the links the same even with the changes made to the videos later on, while vzaar will easily insert your logo, subtitles and calls-to-action into the video. Which Video Formats to Use? If you think your job is done after finding the hosting platform, you’re far from the truth. The next big factor is the video format. Luckily, two of them stand out from the rest. Due to their capacity to fit high-res videos into small files, WebM and MP4 are the most used out there. The “ready-made” platforms such YouTube already use these formats, so no need to worry about that now. However, if your viewers prefer mobile use, MP4 is the way to go. 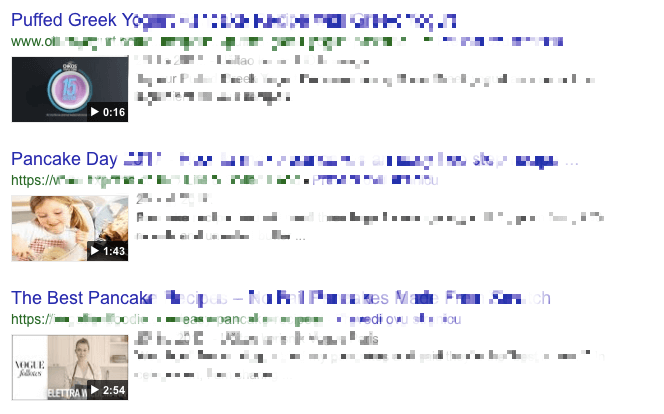 The thumbnail image is that little pic that appears next to the meta descriptions in the SERPs (search engine results pages). 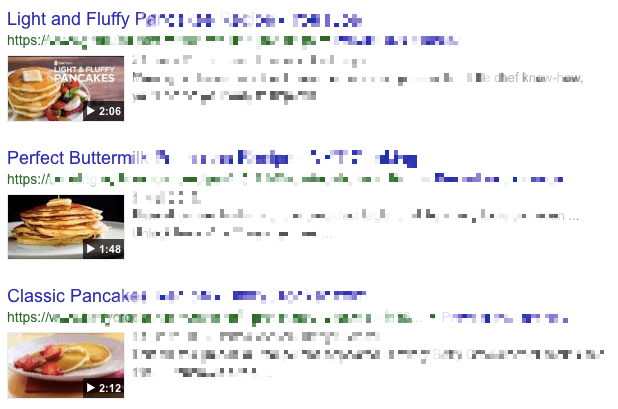 The video without a thumbnail is like a cake without sugar. Bland. Only your hippie friend will eat it because the sugar is his enemy. The same goes for videos. If you lack a thumbnail image or it’s seriously bad, make an effort and produce an engaging video thumbnail image. The first question you have to ask yourself is what is the goal of your video. If your objective is to explain how a drilling machine works with the help of a 3D animation video or to get people excited for making the greatest pancake ever, then your image should show exactly that. Take a look at the screenshot down below. The first one shows clear representations of pancakes. Now take a look at the other one. Which of these is likely to get more clicks? The titles and the descriptions play a huge part in the video optimization. You can start with a keyword research and then get a little creative. Make sure you’re not copying someone else’s video title. Yours should be as unique as possible. Normally, you can’t get away from established phrases and general keywords but do your best. Sometimes the most ordinary phrases as titles rank well. As far as the descriptions go, try to add the usefulness factor to them. Heaps of keywords won’t do the trick anymore. Think about what your regular viewer might look for and be helpful. In the following 3D product animation, we can see a title which tells us what the video represents. The simplicity always wins. Remember that your primary SEO keyword should here be incorporated subtly in the text. Positioning is half of the work. In case you add the video at the bottom of the site, you’ll hardly get any views because people hate to scroll for too long. On some websites, the video is hidden behind a number of buttons. As said, no one will watch it and what’s more, search crawlers simply won’t index a video that’s hard to find. How to make it stand out? Make it the focal point of the page. It can even be added in the .gif format, like the video from the Lois’ website. The Spanish clothing line brand uses little video on an old tv to show the newest collection. It stands out since it’s moving and looks old-school. The fact they added just a little bit of text makes the video even more effective. Being a non-native English speaker is quite difficult for some. Especially if the video is full of new and unfamiliar terms. Considering your company has an international reach, it would be extremely helpful to add the transcript below the video. The best example are Moz’s Whiteboard Friday videos. They upload a video, followed by a hi-res whiteboard image you can download, followed by an audio extracted from the video, followed by a full transcript of the video. Ok, Moz may take the idea of page video to the extreme, but nevertheless, their approach is more helpful than any other we’ve come across. With a background video (that’s usually a homepage video), you have to take a slightly different approach. These videos are huge, they take up half the page (if not the whole) and require a faster internet speed (which certain people have problems with). So, here are a few tips on how to optimize a background video for a better user experience. Even if it’s a background video, keep it small. The solution to this is a shorter video that can play on a loop. Avoid playing it on a loop endlessly. It may look fun, but playing it endlessly will slow down the loading time and use up all of the viewer’s CPU. Limit the number of plays – once they stop, the viewer can concentrate on the rest of the page. Stay away from too much movement. Again, videos with too much of everything will distract the viewer from doing anything else than watching the video. Use 3D product animation videos which usually take up on less CPU while playing in the background. 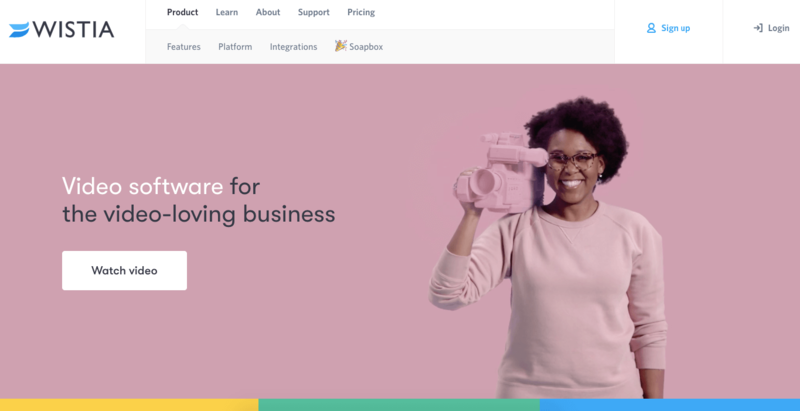 You can find an awesome example of a powerful background video on Wistia‘s homepage. A woman holding a toy camera can be seen dancing for a few seconds before the video goes again. A website with a slow loading time caused by video should be your biggest rival. Fortunately, tiny adjustments such as choosing the right hosting platform, video metadata, clever positioning, adding a transcript and knowing how a perfect background video looks like will get you through to the viewers.